Thomas House is a spacious, beautiful, fully staffed 7-bedroom/71/2-bathroom private hillside villa located in the exclusive Spring Farm area. Overlooking the Caribbean Sea this villa provides the both spectacular views and privacy. Thomas House is located on the east side of Montego Bay, approximately 15 minutes from the airport. The lower level has a master bedroom and second bedroom, with private patio. The master bedroom has its own sitting area, and opens onto the pool-side terrace. The upper level consists of 5 bedrooms, Great Room, with wet bar and a balcony overlooking the pool and the blue Caribbean Sea. Thomas House is less than 5 minutes from 4 championship golf courses: Ritz-Carlton, Half Moon Bay, Rose Hall Resort and Ironshore. 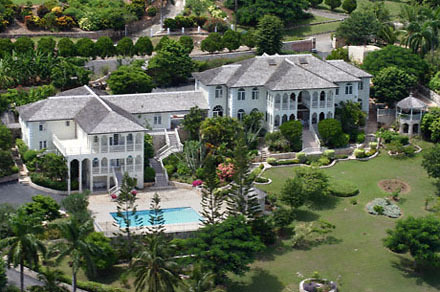 Thomas House was a featured location in the popular movie "Cool Runnings". Located on the second floor, is an elegantly furnished Great Room with dining facilities for 16 guests, a wet bar, and French doors opening out to a balcony with spectacular views of the pool, gardens and sea. See additional exterior pictures. -Bedroom #1 a spacious air conditioned master bedroom on the lower level has a king-size bed, en-suite bathroom, seating area, and opens to a balcony with steps to the terrace and pool. -Bedroom #2 is also on the lower level, air conditioned with ceiling fan, queen bed, en-suite bathroom and has its own private patio with ocean view. -Bedroom #3 a spacious, air conditioned upper level bedroom with king bed and en-suite bathroom, with views to the sea. -Bedroom #4 & #5 air conditioned, with queen size beds with en-suite bathroom. -Bedroom #6 & #7 air conditioned, twin beds in each room each with en-suite bathroom. -Bedroom #8 & #9 located in a separate cottage, Queen beds in each room each with shared bathroom. There is no a/c in this cottage but it does have fans. These bedrooms (8 & 9) are not normally rented and require owner approval. The cook will prepare delicious meals of your choosing that you may have served in a formal setting in the dining area, or more casually, outdoors at pool-side. The villa also has a butler, housekeeper, laundress and grounds man. Golfers will find three of the finest golf courses in Jamaica within minutes of the front door: The Half Moon Resort course with its world-famous 18th hole, The recently redesigned Rose Hall Cinnamon Hill, and the spectacular new Ritz-Carlton White Witch.